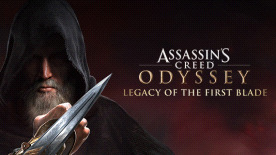 Continue your odyssey in the first DLC, Legacy of the First Blade, and encounter the legend who first wielded the assassin's Hidden Blade. Discover new stories and enemies as you upgrade your Spartan hero with enhanced gear and brand new abilities. Encounter the legend who wielded the first Hidden Blade and change the course of history! Upgrade to the season pass and get both episodic DLC story arcs plus Assassin's Creed® III and Liberation Remastered!